Americaneagle.com adds 2 additional Sitecore MVP's. 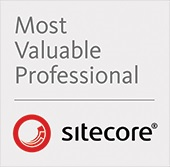 Americaneagle.com is proud to announce that two more members of our team have been named a “Most Valuable Professional (MVP)” by Sitecore, the global leader in experience management software. We’d like to congratulate Ahmed Okour, as he was one of only 177 people worldwide to be named a Sitecore Technology MVP this year. In addition, our own Tim Ahlenius was one of just 35 people worldwide to be named a Sitecore Digital Strategist MVP this year. Now it its tenth year, Sitecore’s MVP program recognizes individual technology, digital strategy, and commerce advocates who share their Sitecore passion and expertise to offer positive customer experiences that drive business results. The Sitecore Technology MVP Award recognizes the most active Sitecore experts from around the world who participate in online and offline communities to share their knowledge with other Sitecore partners and customers. The Sitecore Digital Strategist MVP Award recognizes individuals with strong experience in executing data-driven marketing solutions and proven success in using Sitecore’s experience platform to deliver exceptional business outcomes for customers. “Being awarded two more MVP’s this year is a testament to Americaneagle.com’s expertise in implementing and supporting Sitecore products, whether technical or marketing-related. We’re honored to add to our robust and growing contingent of Sitecore Most Valuable Professionals as it gives our customers confidence that they’re working with true Sitecore product experts with the right experience,” said Mike Svanascini, President of Americaneagle.com. About American Eagle Web Development - Americaneagle.com, Inc.
Americaneagle.com, Inc., founded in 1978, is a leading Web design, development, and hosting company based in Des Plaines, Illinois. Currently, Americaneagle.com employs approximately 300 professionals in offices throughout the country including Chicago, Cleveland, Dallas, Washington D.C., New York, Philadelphia, and Los Angeles. Some of their 5,000+ clients include the Chicago Bears, Capstone Publishing, Stuart Weitzman, International Paper, ADA, Komatsu USA, and more. For additional information about Americaneagle.com, visit http://www.americaneagle.com.